Hey friends! 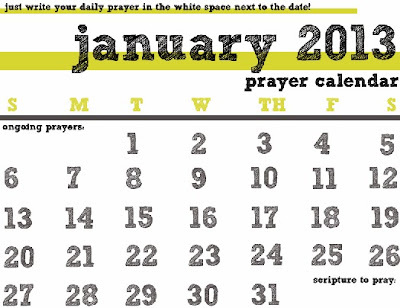 I have a new printable for you today - a PRAYER CALENDAR! This is something that I think will be really helpful for a lot of people. Sometimes it can be hard to remember all the things and people we want to pray for, and this calendar is here to help. Each day, you can write a prayer for a specific person, situation, etc. in the white space next to the date, and on that day, you can pray that prayer! I got this idea from a family that I used to nanny for. They had a calendar taped to their door that a friend made, and on each day there a different, hand-written prayer, specific to that family and their friends. There were things like "pray for the president" and "pray for the ____ family," or "pray healing for ____." You can make them as specific or as general as you want, but I always encourage praying specifically! That way, you know for certain when a prayer has been answered. Plus, God loves when you pray specific, REALLY BIG prayers! This printable also has a place for you to write a couple ongoing prayers & various Scripture you want to pray through (basically, that means reading that passage like a prayer to God). I realize it's small and probably doesn't give you a TON of space, but write small and you can fit all that you need! Click HERE to download the January 2013 prayer calendar! Please leave me some feedback on what you think - I'd love to know so I can make next month's that much better. Simply want to say your work is outstanding. The clarity in your post is simply excellent and i can assume you’re an expert on this subject.. Thanks a million and please carry on the rewarding work. I think this is engaging and eye-opening material. Thank you so much for caring about your content and your readers.